Warm-ups are an important part of each and every exercise session. Engaging in regular warm-ups can help to get your heart moving as well as loosen up your muscles, joints, tendons and bones. This can help reduce your risk of traumatic or overuse injuries (including sprains, strains, tears, pulls, fractures, dislocations, stress fractures, and more). Downward Dog is a yoga position that stretches your shoulders, spine, hamstrings and calves. It is a good stretch for the upper part of your spine between your shoulder blades. Prior to engaging in any form of physical activity, you should engage in a five to 10 minute warm-up. A good warm-up will help to get your blood flowing and improve your breathing rate. This can help to improve your exercise or athletic performance. Gentle stretching should always occur for five to 10 minutes prior to beginning exercise or sports participation. Stretching is a form of physical exercise that specifically targets one muscle group at a time. During stretching, specific muscles are deliberately elongated in an effort to loosen them and prevent injury during physical activity. Static stretching is a type of stretching that requires you stretch a muscle to its furthest point (as far as you can possibly stretch it) and hold is at that point. Static stretches are typically held for 20 to 60 seconds and should never cause your any pain. If you are feeling pain or discomfort while performing static stretches, the stretch should be reduced in an effort to prevent over-stretching and muscle damage to the muscles you are stretching. This stretch is performed with you sitting on the ground with your legs together and straight out in front. Your knees should be straight. By breathing out and reaching forward, you will feel the pulling in the back of your lower legs. Stand up straight with your feet positioned shoulder-width apart and your knees slightly bent. Rest your hands on your hips. Slowly bend to one side without leaning forward or backward. Hold this position for 30 seconds. Relax and repeat on the opposite side. Complete one set of 3 repetitions for each side. Sit on the ground with your legs fully extended in front of you. Your knees and toes should be pointing toward the ceiling with your back straight and your heels touching the ground. Place your hands (palm side down) on the ground beside your hips. Slowly slide your hands in the direction of your ankles while leaning forward at the waist. When you begin to feel a stretch in the back of your upper legs, stop and hold this position for 30 seconds. Relax and repeat three times. Stand with your hands positioned flat against a wall and assume a lunging position. Your front knee should be bent with your back leg fully extended. Both of your feet should be flat on the ground. Gently lean forward at your hips until you feel a stretch in the back of your straight leg. Hold this position for 30 seconds. Relax and repeat three times for each leg. Dynamic Stretching may also be referred to as active stretching and is sometimes taking the place of static stretching during many warm-ups. Dynamic stretching can also be seen as a form of sports specific training as many of the moves during dynamic stretching replicate moves that are performed during various sports. Dynamic stretching takes muscles through their entire range-of-motion by starting out slow and gradually increasing the range of motion. A knee bend standing stretch also strenghens your core and helps you learn proper balance. Similar knee bends repeated across the room in a walking fashion would become a variation of a high knee march, an example of a dynamic stretch. Dynamic stretching may help reduce muscle tightness as well and is very effective before a work-out. Dynamic stretching harnesses the speed of movement and muscular effort by requiring a range of motion that is a bit more extreme than what would be typically required during that activity. It uses the inertia of your movement but then adds a stretch at the same time. Dynamic stretches are usually performed following an initial period of cardiovascular exercise (ex. Running, swimming, cycling). Most dynamic stretching routines will include five stretches, which are performed in one set of 6-8 repetitions. 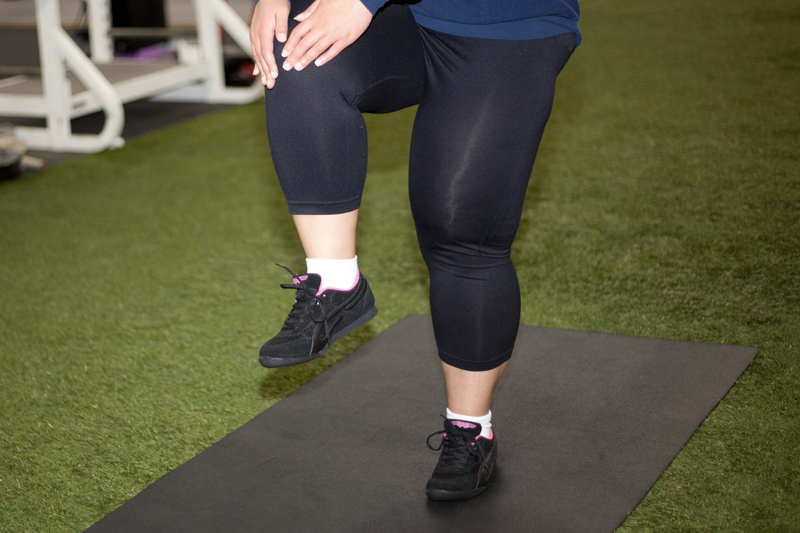 These are knee lifts that are performed in an exaggerated fashion performed when walking or running very slowly. You should forcefully raise your knees up toward your chest in a running motion much higher than would be required during a normal step. Drive your knee as high as possible and at the same time drive your opposite elbow forward. Dynamic lunges are performed when walking slowly across the room. You basically drop your trailing knee to just above the ground while keeping your body upright. Your front thigh should be parallel with the ground and your back upright. Putting your weight on your front leg will help stretch the hamstring. These also provide a very strenuous workout for your gluteus muscles (your rear). Cariocas are a hip rotation exercise performed during a side step motion. While side-stepping, you alternate your opposite leg to side step in front of and then behind your other leg. For example, if you are going to the right then your left leg will cross in front of your right leg with the first side motion. The second side motion you swing your hips and then your left leg will cross behind the right. Continue alternating in this fashion. PNF stretching is short for Proprioceptive Neuromuscular Facilitation. PNF stretching can take on several forms including hold-relax, contract-relax and rhythmic imitation. PNF can be active or passive stretching. Passive stretching indicates that a muscle is taken through its entire range of motion with the aid of another individual (such as a physical therapist or trainer). This type of stretching is often used during physical therapy and rehabilitation. The hamstrings, feet, knees and hips may all be stretched using PNF stretching. Relief from muscle soreness due to the promotion of blood supply and oxygen to your muscles. Helps to prevent sprains, strains and muscle tears. Can also prevent re-injury at the site of previous joint or muscle trauma. Increased tissue temperature, which means increased metabolic rate. Start with easy stretches that can be performed when standing or seated. Stretches on the ground may often be difficult and uncomfortable. Please make sure you are on a padded matt and start slow.